Were the GPA caught blindsided by this and reacted too late? Looking back at September’s final again yesterday, one other thing that came to my mind was with regard to the"forward mark" is that a defending player should be similarly awarded (if the rule is introduced) if making such a catch. Too often, a defender (or goalkeeper) makes a great catch, like Howard did at the death v Tyrone, but, unlike Howard, they can’t stay on their feet and are engulfed by two or three opposing players and get pulled up for over-carrying. Agree completely. Should be for both sides or none. I think these rules will die an ignominious death. It is one of the (temporary) rules I don’t agree with. But if you’re going to reward an attacking player making the catch then it should also apply to a defensive player. This is the case, A defender or GK can indicate he wants the mark in the same way a forward can once the ball has been played from outside the 45m and traveled the requisite distance. The game would become totally stop start. Fair enough, I (obviously) didn’t realise that. When will know if new rules will be implemented for league? The GPA were supposed to have meeting with GAA about this. Will be discussed after the Mickey Mouse competitions are finished. 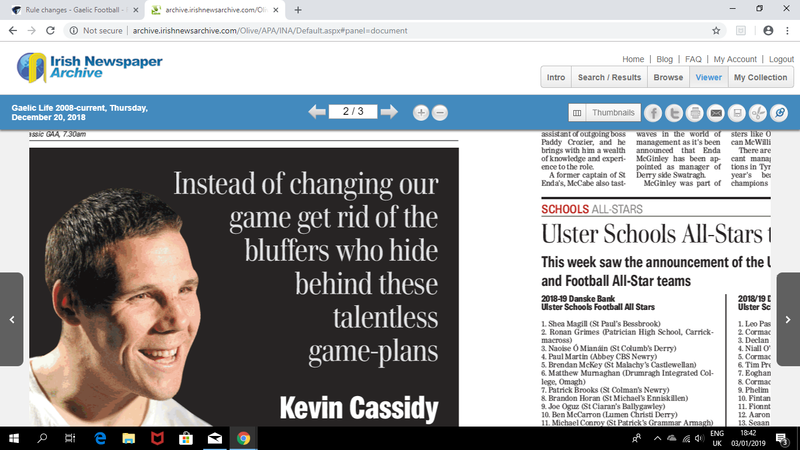 Kevin Cassidy on the button here. I see Sunday Game were “giving out” about the 10minute sin bin and the amount of time 2 players were down cutting the actual sin bin time by almost 6 minutes. Once again, this firefighting horse sh*t has to come to an end at some stage. The rules, agreed with the or not were put out well before the league, only now some of our “leading pundits” are beginning to see the lunacy of the way some of them are constructed. 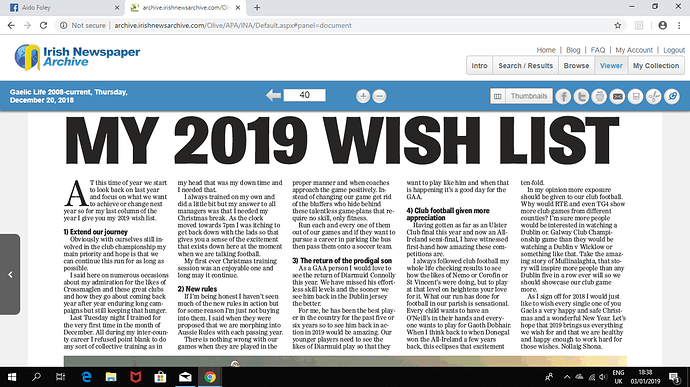 The sin bin issue particularly was discussed here at length, highlighting the exact problem now the experts have just copped. Reminds me of inter county managers giving out about playing matches closely together etc in championship. Again, crap. The master fixture list for champ is laid out well in advance and includes replays (if needed) or back door games (again if needed).